Don't have a heart attack, but yes indeed, this is me blogging two days in a row! WHOA! Vikings! How cute is that?? I can't wait to see it in person. My folks have decided to come for Christmas, so I figured it's probably best that I make something for them as well (which really means something for my mom, since I'm pretty sure my dad's not huge on interior decorating). My mom pointed out several blogger bundles from Pink Castle Fabrics that she likes - unfortunately, most of them are out of stock! And she also liked the Sea Glass Bundle and Summer Blooms (both out of stock! )...But I'm looking for a few more options. 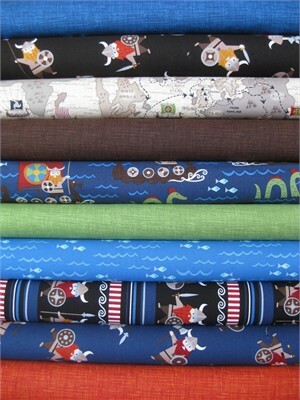 Where do you shop for pre-put-together FQ bundles that aren't necessarily from the same fabric line? Have you asked them to recreate it for you? They might (if the fabrics are still in stock). A lot of Etsy sellers will do custom listings, too.